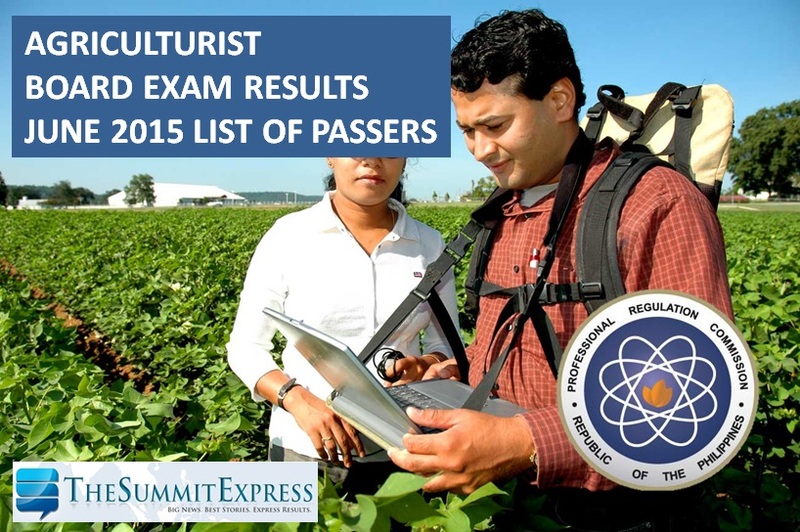 Those awaiting results of June 2015 Agriculturist board exam can find here the full list of passers, top 10 (topnotchers), top performing school and performance of schools as the Professional Regulation Commission (PRC) and the Board of Agriculture released results in 4 working days after the last day of exam. PRC on Wednesday, June 10, said that 1,888 out of 6,080 passed the Agriculturist Licensure Examination. The Board of Agriculture who have conducted the exam in Manila, all Regional Offices (except Pagadian) and Zamboanga on June 2, 3 and 4, 2015 consists of Dr. Fortunato A. Battad, Chairman; Dr. Rodolfo M. Ela, Dr. Nora B. Inciong, Inv. Gonzalo O. Catan, Jr. and Mr. Vicente L. Domingo, Members. Agriculturist board exam covered the following subjects: crop science and soil science (Day 1), crop protection and animal science (Day 2), and agricultural economics and marketing and agricultural extension and communication (Day 3). In June 2014, PRC announced results in 4 working days after the exam. PRC named 1,808 out of 5,022 who have passed the Agriculturist Licensure Examination. University of Philippines (UP) - Los Baños topped the schools with 98.78 percent passing rate. Like Us on Facebook, Follow Us on Twitter or subscribe to our e-mail list to receive more updates related to Agriculture board exam.